Getting back to the final Disney posts (because if I don’t post them here, I won’t remember the details). 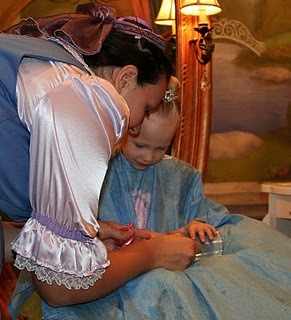 On Monday afternoon Juliana had her appointment at The Bibbidi Bobbidi Boutique at Cinderella’s Castle. 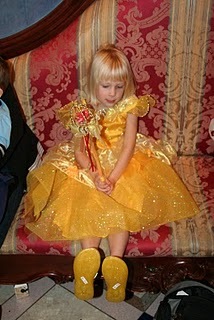 The package was a gift from Nonni and included a Belle dress with shoes, crown and wand, the hairstyle of her choice, makeup, nails and a photo session. 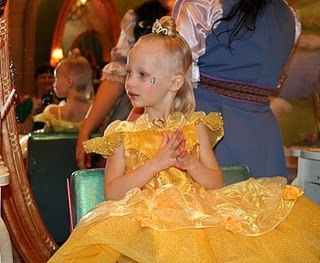 We arrived at the Boutique and waited for Princess Juliana to be called back. 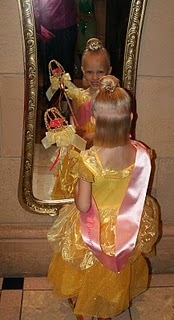 She went back to the dressing room and her dress and accessories were waiting for her. 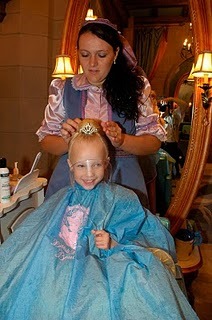 The “salon” area was filled with stations designed for little girls. 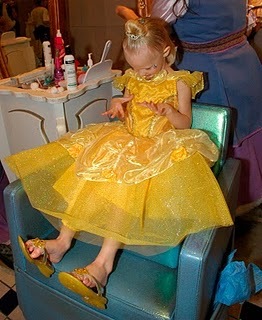 Chairs like little thrones and fancy mirrors on the wals. 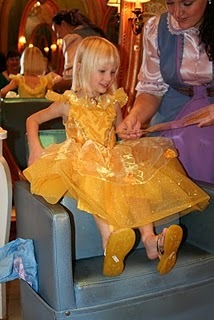 Juliana climbed right up in the chair and selected her hairstyle. 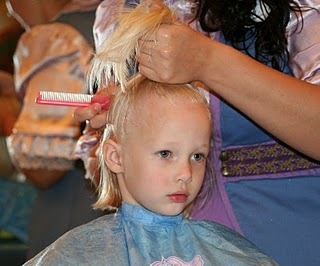 During the entire process, no matter how tight her hair was pulled, she never complained. This is the child who runs from the hair brush at home and never wants even a ponytail. 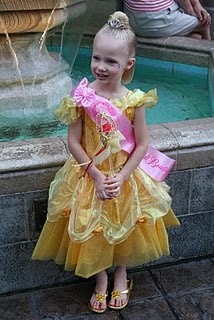 After her hair was pulled to the top of her head, the tiara was slipped into place and a huge amount of glitter hairspray was used to hold her hair just right. 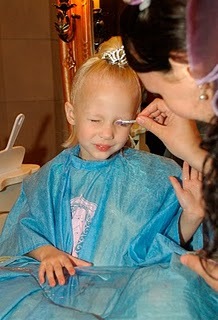 Then is was time for nails and makeup – I told her we should not tell her Daddy about the eye shadow and that is of course the first thing she told him when we got home. 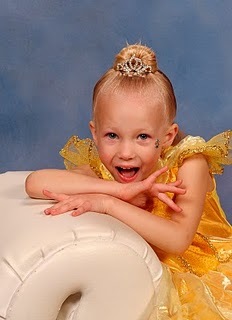 After the wave of the magic wand and the magic words – Bibbidi Bobbidi Boo – the transformation was complete. 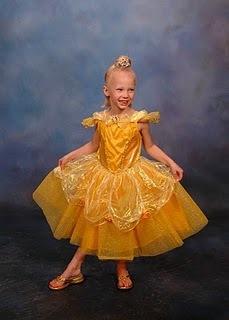 Then it was off to the photo studio for her photo shoot. This was such a fun experience – I highly recommed it! The photo shoot is the one thing we didn't do that I wish we had. This year we'll make it happen. 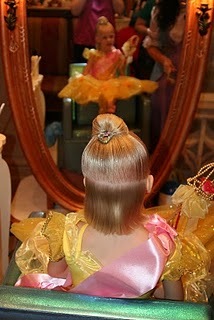 I think every little girl must pick that hairstyle. 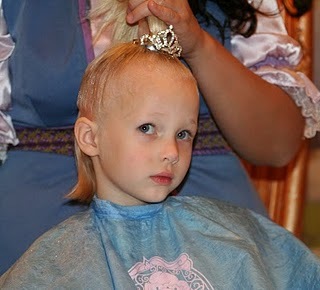 Alexis did, too, but I talked her into another one and then bought the crown separately. 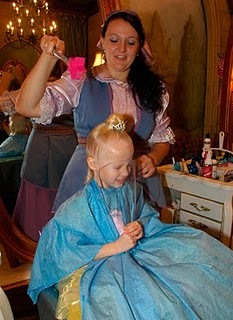 Hopefully I can work that mojo again since she doesn't have nearly enough hair for that one!